Gippsland Lakes Community Health (GLCH) is a leading not-for-profit provider of health and wellness services in East Gippsland, providing more than 2,000 older people, their families and carers with quality in-home and community based services. 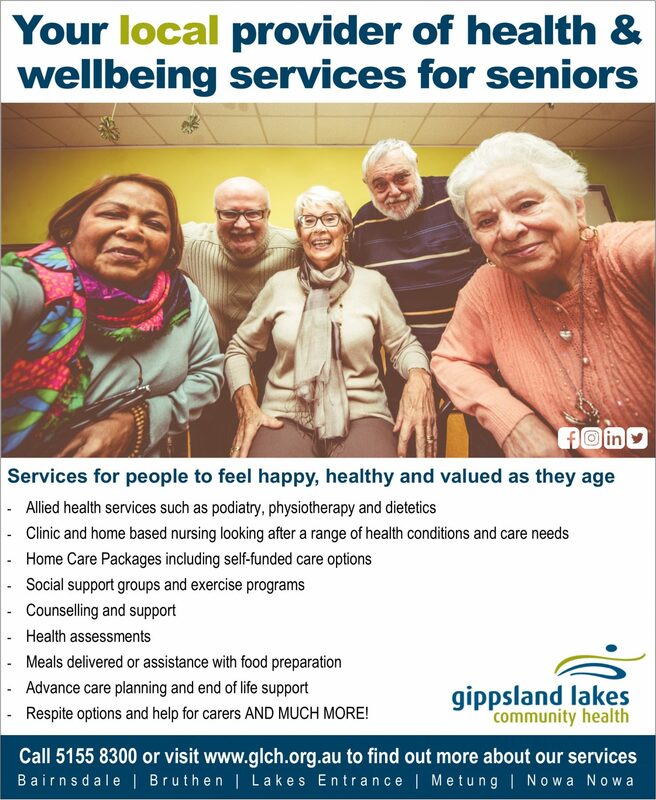 “GLCH has been delivering quality health and wellbeing services for over 42 years and we provide a suite of services for seniors that are designed to enable a happy, healthy lifestyle at home and in the community,” said Sue Medson OAM, chief executive officer at GLCH. Staying socially connected on a regular basis is vital for the wellbeing of our ageing community members. GLCH offers a variety low cost social groups and activities each week that provide physical, intellectual, emotional, social stimulation to participants and respite and support for carers. New groups, like Monday on the Move and Blokes BBQ are taking seniors out to explore and reacquaint themselves with our beautiful local area. “Participants are having a great time out and about – visiting local landmarks, barbequing or sampling afternoon tea at cafes; and have even featured on our Facebook page,” Ms Medson said. A comprehensive suite of allied health services and therapies are also available to help seniors maximise independence and remain active and healthy. GLCH offers flexible services including physiotherapy, podiatry, exercise physiology, occupational therapy, personal trainers and a range of fitness groups that aim to improve mobility, manage chronic illness and pain and improve fitness.